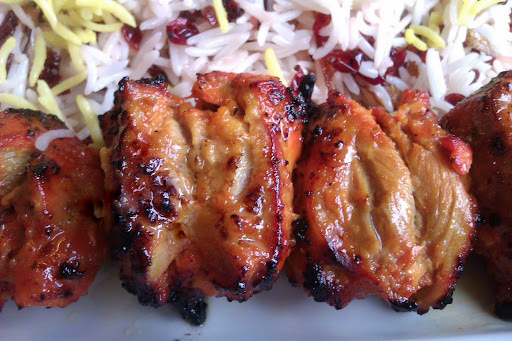 Joojeh (chicken) kabob is marinated in fresh lemon juice and saffron and then grilled on an open flame or charcoal grill. Made boneless (bedooneh ostokhoon) or with bones (boh ostokhoon), joojeh kabob goes well with basmati rice or any flavored rice dish – my favorite is with zereshk polo! Shirazi Salad is made with diced cucumbers, tomatoes, red onions, chopped mint leaves and fresh lemon juice. Crisp and refreshing, Shirazi Salad is the perfect side dish to go with joojeh (chicken), koobideh (beef) and barg (filet mignon) kabob. Combine all ingredients in a bowl. Mix well. Add salt and pepper to taste and garnish with sprig of fresh mint. *Persian Cucumbers are small seedless cucumbers with a slightly sweet flavor. The thin-skin exterior and light water content make these cucumbers ideal for Shirazi Salad – always crunchy and no peeling needed! Available at any Persian grocery store, Trader Joe’s and even Costco.